New, improved series that replaces the popular Chosera Stone in the past. There are regular sharpening stones and those that become your favorites and most valuable possession. The Naniwa Professional stone is one of these products. All are designed for the most requiring users, not only sharpen perfectly, but also quickly. The professional Naniwa series is so good that it's really a pleasure to use it. The dimensions of this series stones are 210 (8-1/4”) long x 70 (2-3/4”) wide x 20 (3/4”) thick mm.. This size is just about perfect for most knives and tools. For single-sided stone, the thickness is sufficient and allows it to be used for a long time. The series comes in the following roughness: 400, 600, 800, 1000, 2000, 3000, 5000, and 10 000. You do not need to own all of them, but we recommend you to select at least three for the perfect result – both for rough and fine sharpening, as well as polishing. A good combination of stones is with grit 400, 1000 and 5000. The production of abrasive stone with roughness 10 000 is extremely difficult, so its price is considerably higher, but it would polish each blade perfectly. 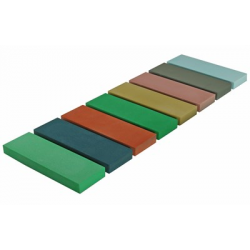 What makes professional sharpening stones different from other stones is the bonding of grains, using magnesium. Magnesium bonding contributes to greater density and fine abrasive particles. This gives the fastest sharpening of your blades. Experienced users can really feel a difference with these stones. Carefully soak the stone for about 15 minutes before use and then it is ready for work. We recommend using a spray bottle with additional water during sharpening, to keep the stone wet. Like many top-grade products, the Naniwa Professional Series stones require more care than regular abrasive stones. It should not be left in water for a long time, this will negatively affect the magnesium bond between the particles. When you have finished sharpening, just let the stone dry in air evenly. Do not try to speed up the drying process by exposing it on heat. Store the stone only after it is completely dry. If these extra cares are too much and difficult your work, we suggest you choose another type of stone. Each Naniwa Professional Stone is wrapped with cushion inside the box to ensure that an arrival in perfect condition. Purchased from us we also take an extra care and give our "royal treatment" in packaging, so every stone arrives at your location in the same condition as it was when it left the factory. The Naniwa Professional-series is the improved version of the Naniwa Chosera Stones. Naniwa has rene..